This tea is made from whole buckwheat plants (i.e. cauline leaf, flower and root) that are grown at 3000 meters above sea level in the pollution free environment of Gao Han district. The processing method is an ancient recipe passed down from Yi Minority tribe in China where it uses low temperature to dry the plants before they are grinded into powder and finally rolled into pellets. This tea contains the nutrients from the whole buckwheat plant. Buckwheat is known to help to control obesity, stress, high blood pressure, and cholesterol. Smooth, rich and sweet with a hint of coffee fragrance. Good for multiple infusions. 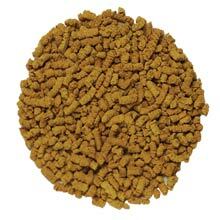 The tea is rolled into small pellets. Infusion is yellowish gold in color.